ColorChallenge - Orange Tuesday - @nenio in 7 World's Continents Photo Challenge! Let me introduce you to a great Steemian and contributor to my daily 200 SBD 7 World's Continents Photo Challenge, an amazing photographer @nenio. Let's give him some recognition and a shout out. In combination with the color challenge, it is a great place to highlight his photo skills and give his hard work some extended publicity and appreciation. The marinas and ports are one of the common ways that mankind has modified the coastlines for its profit. 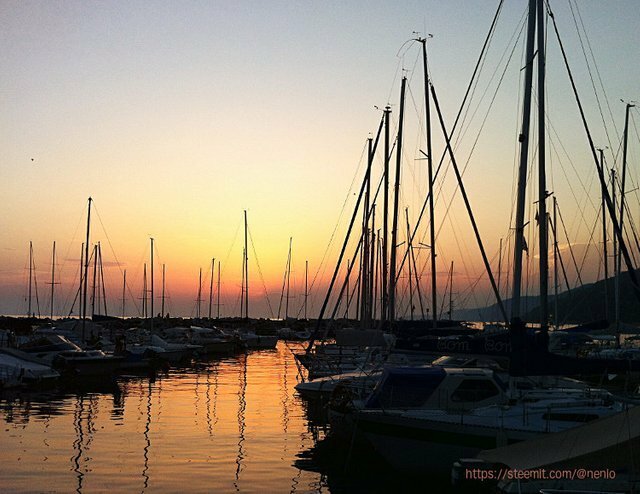 The photo was taken in a marina in Adriatic city of Trieste in Italy, during the magical golden hour of the sunset. To give @nenio a little support, I am upvoting his post called El Puerto de Trieste. Feel free to join me. ColorChallenge - Purple Sunday - @immarojas in 7 World's Continents Photo Challenge!